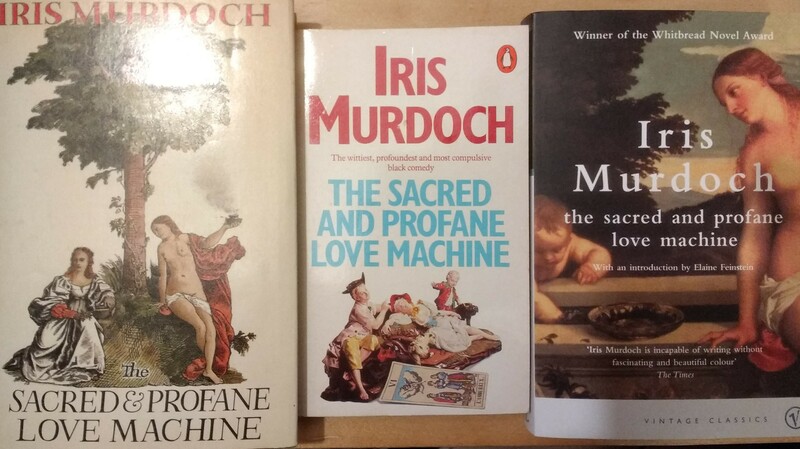 So it’s time to round up our reading of “The Sacred and Profane Love Machine” and look forward to what has always been a personal favourite of mine, “A Word Child”. 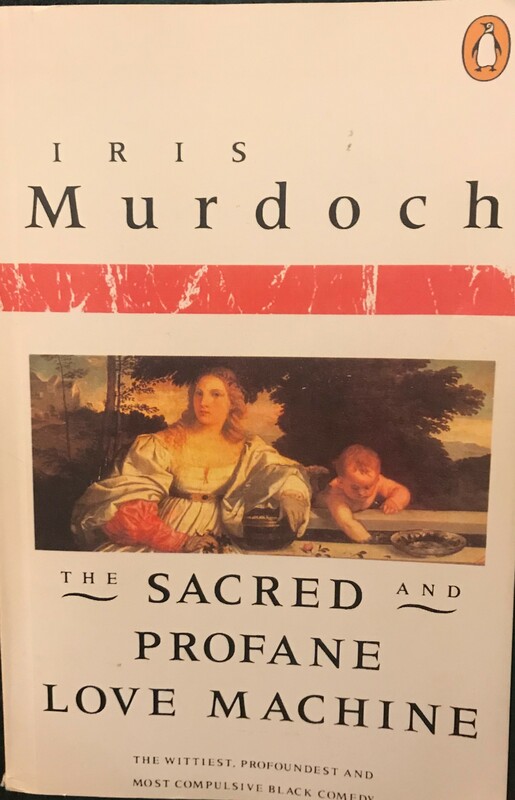 My review of “Sacred and Profane” is here and we’ve had a good discussion in the comments, particularly on the roles of wives and mistresses. 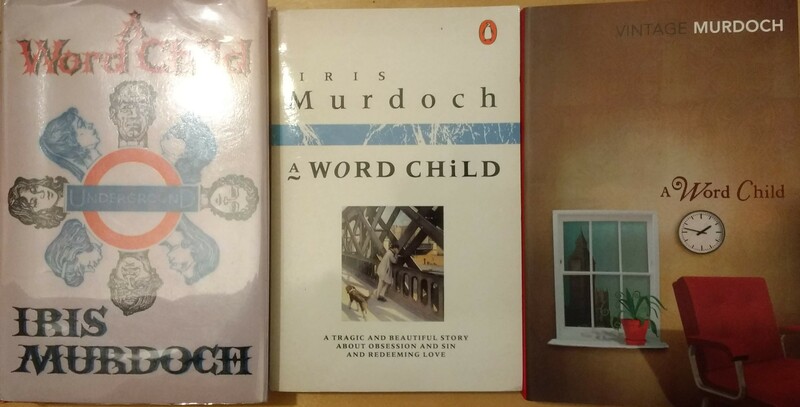 Do pop your thoughts in the comments there if you have any to add – and don’t worry if it’s not February 2019 when you do so – I always want to talk about Murdoch! Away from my review and comments, Bookish Beck has been reading along with us with all the IM books she had, and has now finished (I thought she had “The Book and the Brotherhood” but I must be thinking of someone else, and did a great review of this one, with which I tend to agree. Jo’s Goodreads review is excellent as ever and I love the quotes she pulls out as well as those memories of trendy 1970s living rooms! I cannot WAIT to read this one. Set partly on the London Underground with the most delicious doubling and repetition and patterns, groovy coats and drug references and some pop music, I seem to remember. I’ve always really liked this one, maybe because I understood it a bit better, seemingly buying and reading it first on my 23rd birthday! Here are my three copies. I love the First Ed but it’s a bit fragile to release entirely from its protective cover, so sorry it’s a bit reflective. Guesses on who all the heads represent (Oh, I THINK I’ve done a diagram of the relationships in this one that goes in a circle, something to dig out for the review!). So Penguin had got into their new edition when I bought my copy in 1995 and there’s a great picture of the Hungerford Footbridge on it – I always thing of this book when I’m in London and trot across the bridge. I’m not quite sure what the IKEA chair on the new Vintage represents but there we go. You will find a page listing all of these blog posts here, updated as I go along. A birthday book from last year today, and a book I’d heard about and seen but hadn’t got round to picking up: I’m glad I was compelled to read it by being given it as I did get a lot out of it. It’s always particularly lovely to read about your home town and Fowler appears to live so close to me that I’m pretty sure I must know somebody who knows her, One Degree Of South Birmingham being what it is! Narrative of a summer where Fowler explores the canals of Birmingham in a very small inflatable boat (why have I never seen her?) and also comes to a surprising and marriage-ending realisation about herself. I get frustrated with nature books that shoehorn personal life into them to cover more bases, but here the two are tightly interwoven and the beautiful writing draws irresistible parallels between the two. It’s also a lovely celebration of friendship and of other people’s relationships – Dave and Louise who live on a boat, strong and happy Sarah and Ming, each bringing her strengths and happily bickering about how to row their own boat. I really loved, of course, when she described “our” bit of the canal (see my running posts on a Sunday for endless canal pics), including the lovely toll cottage which devastatingly burned down WHILE I WAS READING THIS BOOK and the Brandwood tunnel – now I know the picture of the man on one end is Shakespeare, which is nice! I also loved how they collected sightings of themed things like coconuts on their travels, something I often do with my running buddies. She also writes brilliantly about how we make maps full of our own experiences – again, something that running has given me (here’s the place where I sat down and had a cry, here’s where we ‘chased’ that nun up the Bristol Road) so that was something lovely to identify with. I can’t help wishing there’d been a real map in the book, however. There is naturally some dead and icky stuff seen on Fowler’s travels: I was OK with it and I’m pretty feeble, as long-term readers know; it wasn’t gratuitous at all. The descriptions of nature and its interface with industry and residential areas was fascinating and the book as a whole was an interesting meander through the natural environment, with a moving story of a woman finding herself woven within it. No acquisitions recently, although I did find a cheap edition of a scarce Virago for Ali! I’ve moved on to reading my book about the Brixton Academy bought last month, and am writing a review of Malala’s dad’s book for Shiny which I will link to here when it’s published. I really hope I get to read more books next month! Plucked from the middle of the TBR because I won her Dad’s book on NetGalley (I have read that now but am going to review it for Shiny New Books so will share my review there when it’s done – I’m glad I read this one first). It does feel like I’m the last person to read this book, so I was pleased when Gill brought it to put on the coffee house shelves and I could grab it, especially as Malala moved to Birmingham when she came to the UK for medical treatment, and I wanted to read about what she thought of our city. The updated autobiography of the famous advocate for girls’ education in Pakistan, including her journey for treatment and new life here in Birmingham (I’m glad she likes our city, on the whole). Her story and personality are remarkable but her father comes across as remarkable, too (on a side note, I was a bit shocked to realise he’s about my age! But of course he is!). I hadn’t realised that she’d made a film with the BBC and produced a diary of life under the Taliban’s rule for them, too, so it made more sense about her coming here. I was proud to read about the care she had from medical staff here (including the Muslim chaplain and various nurses who found food and care for her) and I liked her relationships with her old friends, still going strong. It’s well done as there’s enough history and cultural stuff to explain the background but all related to Malala and her family, and enough detail on the violence and repression to make an impression, but never gratuitous. She comes over as a very normal young woman as well as an exceptional one, and it’s a great read that I highly recommend. As promised, I’ve managed to get this one read a bit earlier than the December and January reads, so there should be plenty of time for discussion before my round-up post. I’ve had some front covers sent to me already but always have room for more for my post at the end of the month! 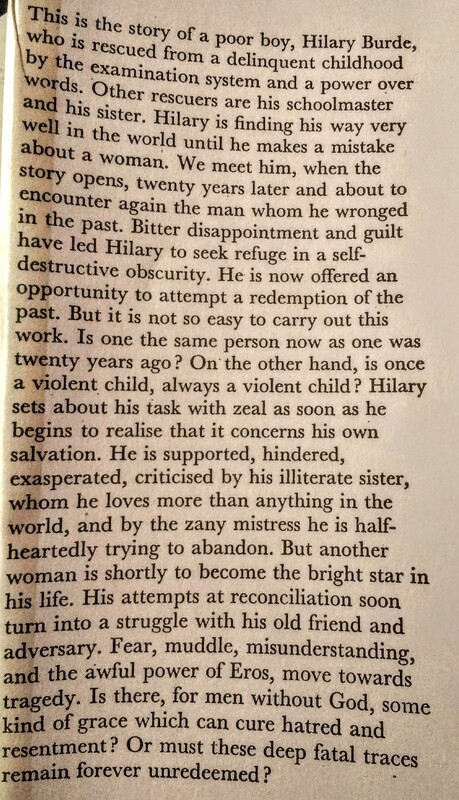 Note I can’t help but have plot spoilers in this review, so maybe save it to read later if you haven’t read the book yet and intend to! So this one was of course a re-read, probably my fourth read of it; I’ve always seen this is a bit of a minor work (and only really remembered the shocking act near the end) but I got such a lot out of it this time, and reassessed my feelings on various characters, as I seem to this time round, as a married mid-forties person. It’s so interesting how our views change, isn’t it. What a rich setting for a novel! Two houses and a flat, two families, two sons, a sort of Greek chorus observing things in the shape of two misfit neighbours, and then a drunken truth-teller. Although there’s a small cast, this doesn’t feel as suffocating as some of her novels, maybe because there are voices from outside. And we have lots of pleasing tropes that echo through the other novels – including many people standing in gardens looking in! The opening of the book is very strong, with three separate characters all gazing at a small figure in the garden of Hood House. We also see Harriet’s “pale form” (p. 14) in the garden early on. We also have Emily running down the street away from Blaise and being chased, and then falling (doesn’t someone else do this?). And hooray – Monty climbs a fence, continuing a long stream of fence-climbing in these middle-class thinking folk that IM likes to write about! 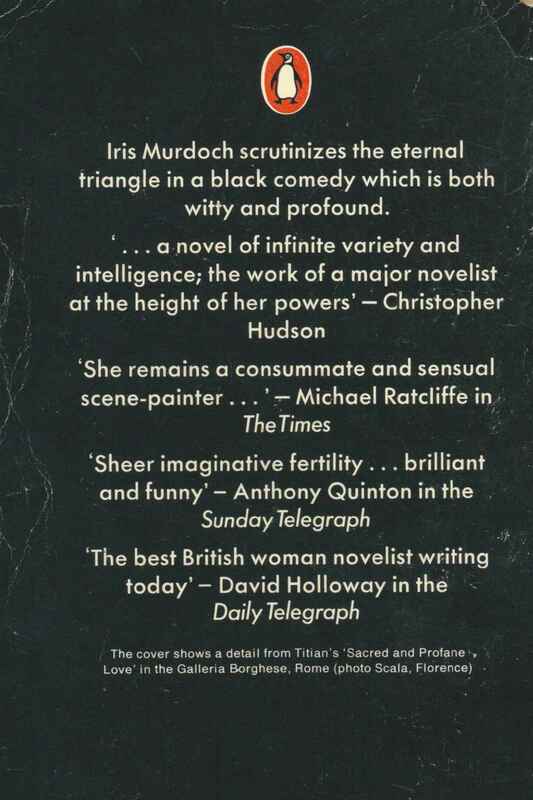 I also now feel that people opening their tops to their waists is a trope and not an echo of this book or that book – Pinn does it to Monty here (but he doesn’t act on the temptation). Ectoplasm is one that’s only come in since about “The Nice and the Good,” with Harriet describing herself as it here (p. 238). Cluttered rooms, that favourite of IM’s, are only really found in Harriet’s domain, where she’s collected all but the “serious family stuff” and gaudy things from holidays. It’s awful when these are disposed of later, isn’t it! 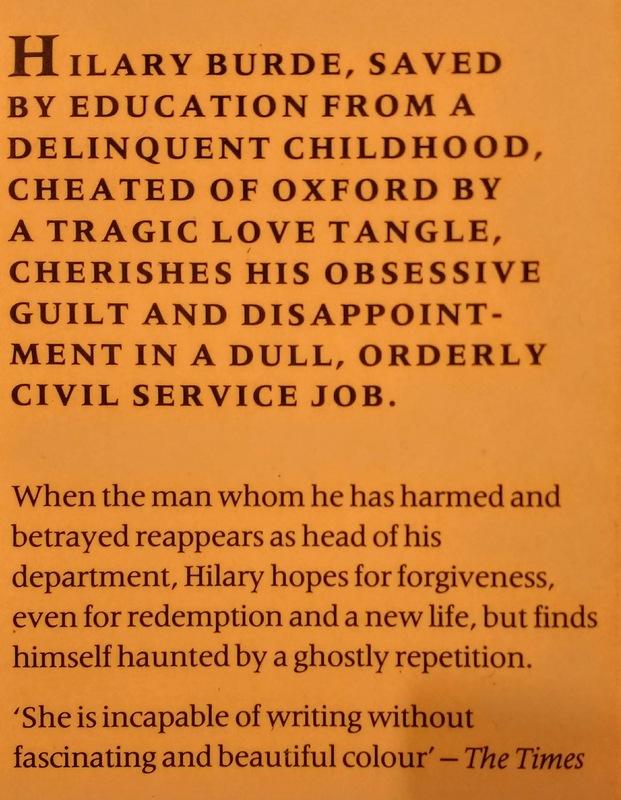 Poor old Harriet, I could remember what was going to happen all the way through, the downside to re-reading, although there are some pretty clanging portents, too. Back to the usual themes and we have soldiers – Harriet’s father and brother. Have we had a soldier recently? We have a big important book which Blaise is failing to write. Edgar is a pink man with a fat face and fluffy hair – a real Murdoch type and of course Monty is dry and severe, another type. 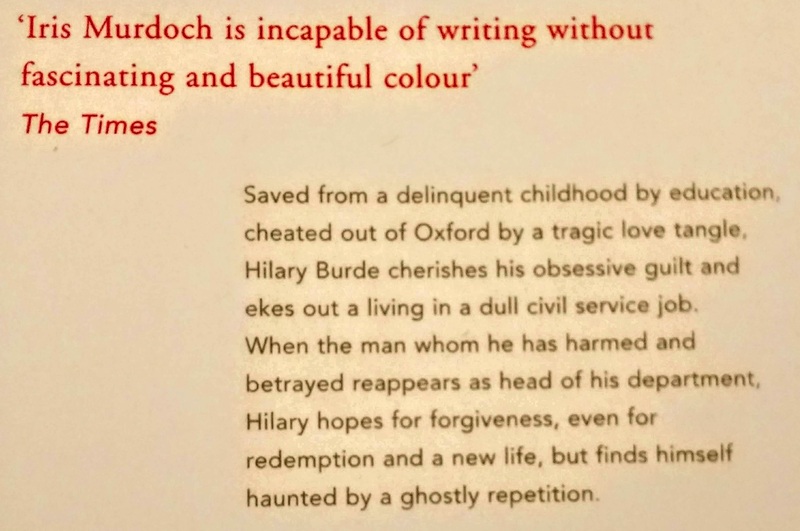 Just like when Gracie in Accidental Man messes up the bits of London that IM most loves, Blaise is “not interested in pictures” while Harriet has amazing pleasure from them: a sure marker of a dodgy character and a good one. Another indication of goodness and badness is in the reaction of the dogs to people, rolling around happily with Edgar, trying to eat Blaise! There’s some great doubling, too, not only the two families, two households, two sons, two deflowerings but also a severing of the Achilles tendon in the TV detective series and when Blaise gets attacked by the dogs. There are two brothers in some kind of an asylum (as described in the novel). On the portents, crikey! When Emily is having one of her moans about her second-best status in the arrangement, first of all she claims “I’m the flesh and she’s the spirit, don’t tell me, I know!” and then, chillingly, “God, sometimes I feel like people who go to an airport with a machine gun and just shoot everyone within sight. You simply have no idea how much I suffer” (p. 79). In addition, when Harriet is dealing with finding out about Emily, she brings to mind her soldiering family and then, “Harriet was determined to stay upright now in the gunfire” (p. 131). Did first-readers notice or go back to this? Who is the saint and who the enchanter? I’m not sure there’s an enchanter as such, is there? Blaise likes to think he is and it’s interesting that all his patients do so much better when he withdraws from their lives, but he’s imposed himself on them more than being created as an enchanter. Harriet doesn’t think she’s a saint, finding her charity work and interests easy and boring, and feeling she’s selfish. But her last act is a selfless one, of course. Blaise thinks (or thought) of her as “not an intellectual but – what? – a sort of saint? Well, not a saint so much as a noble lady” (p. 58), also saying that she’s completely normal and absolutely open (as contrasted with his peculiar desires (unspecified) that he shares with Emily. Monty sees her as “a gentle utterly harmless person who could make no one her victim” (p. 179) however, these are both men seeing her through their eyes. There’s an indication of the nature of goodness when Monty remembers Sophie’s dying: “He ought to have accepted that suffering from her with profound gratitude as a proof of her love” (p. 22) but he didn’t. Three good-looking women, he thought, and all of them after me! And he could not help being a little bit cheered up and consoled as he got into the Bentley and set off alone for Oxford. I thought a lot more of Edgar this time around. Whoever the saint is, Harriet has learned and changed by the end of the book, realising she’d not been prepared for the battle she had to fight – “for a situation where she was not needed she had no heroism” (p. 235). She tells Monty she has become her own person and hard in the middle, although he’s not hugely impressed and seemed to prefer her vague married form. So a deep and satisfying and complicated book (though the inter-relationships are not too hard to understand this time round). And a new favourite character in Edgar. Please either place your review in the comments, discuss mine or others’, or post a link to your review if you’ve posted it on your own blog, Goodreads, etc. 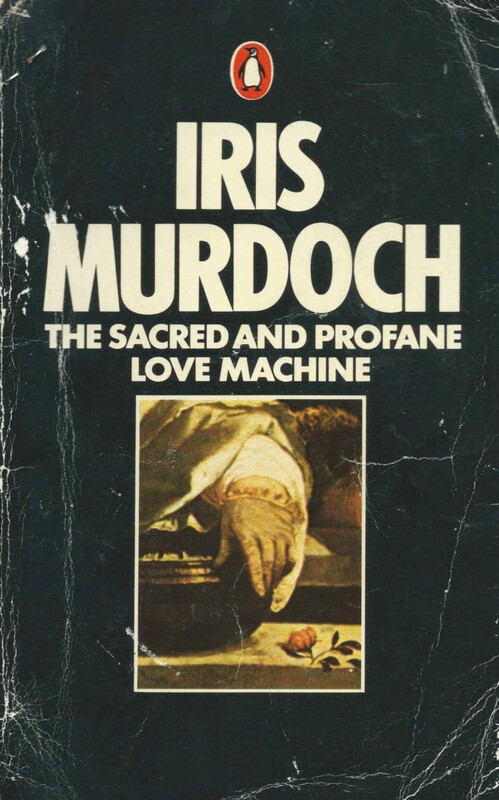 I’d love to know how you’ve got on with this book and if you read it having read others of Murdoch’s novels or this was a reread, I’d love to hear your specific thoughts on those aspects, as well as if it’s your first one! A week when I ran on pretty well completely different days than I usually do but there we go, a change is as good as a rest, etc. I also did my biggest week in mileage terms since April 2018, so I’m glad it’s rest week next week! I’ve also kept up doing my physio exercises twice a day 5/7 days per week for February Five. Here she comes! There aren’t usually so many bins out on the street. In fact we then saw the bin lorry finally taking everyone’s recycling (there’s been a dispute recently). Claire got 15.7 miles in and that was a hard one, running to work, having three meetings then running home! I was very glad to help her and guess what, a recovery run DOES HELP! Wednesday – I went to Dave Yoga in the morning – I had to ask him not to adjust me as I was under the physio, and I concentrated very hard on trying to activate and use my lower back rather than just heaving on my hamstrings. All OK though a bit tired from concentrating! Then Trudie, Caroline and I had a very pretty dusk run with a lovely sunset. What fun – we all needed some time outdoors with other people and there we went. I was also pleased to finally manage to make a “hat” out of my buff, having seen some instructions from my friend Dave online. Yes, doing it “on” and not overtwisting did work! Buff Hat for the win! A fun run: I started with Caroline while we waited for Trudie to be back from work, and Trudie and I looped back home together after saying goodbye to Caroline. Thursday – my second physio session and I was nervous as I had done my exercises but was feeling stiff, esp in the lower back, plus my right shoulder and neck were hurting. He was however pleased with my progress and worked on my spine (ooowwww) and I felt a lot better afterwards. I got the bus down and back to save time, and that worked well. No appointment now until Monday week so I can work on all my exercises. He did say rather ominously that I was about 6 months away from an actual injury at the rate I was running, but I’ve done the right thing and we will hopefully prevent that. Friday – went to Claire yoga and tried hard not to overstrain myself by pushing it, so felt a bit teary afterwards. Which was a bit silly, but sometimes yoga makes you teary anyway. Saturday – I was rotaed to lead the club’s four-mile Saturday run which is taken at a gentle pace (12-13 mm) and is aimed at people moving up from the Beginners’ sessions on Saturdays. So I decided to make that part of my long run rather than running two days in a row (which I realise I did anyway!). Unfortunately, I’d had a stressful Friday evening (nothing too dramatic, resolved now) and not enough sleep, which are NOT good for my running, so I didn’t hold out much hope of doing the 16 I wanted. I ran 4.3 miles on my own to get warmed up, then met Trudie, Sonya and Bernice (yay, we saw Bernice, who I ran the Canal Canter with last August but has moved away a bit so we don’t see her often. Lovely to run with her again!) and one woman who’d come for the club run as she had been all year so far. She was a bit fast for me and we had to teach her loop backs but it was a nice run, kept to the advertised pace (I wouldn’t have been quicker if I’d not run first or after as it’s a hilly route) apart from when my water bottle fell apart suddenly! I did some stretching at the end then Trudie, Bernice and I carried on along the club’s summer canals route, which we could all remember and which had some of the Canal Canter in it. Bernice had done parkrun before the club run and Trudie had been out the night before so we were all a bit delicate and walked / stopped for photos as necessary. Time below is run time not elapsed time but on the day of the marathon etc I will have SLEPT for example! We got onto the canal at Bournville railway station and I had to share this lovely bit of public art. But I’m going to be honest and share these pics where I am not looking my most happy, because this is an honest blog and it’s certainly not always easy! In Bornville, Bernice, Trudie and Liz, photo by Bernice, with permission. What is my hair doing? That desperate smile stuck with me (the other two are so beautiful and fresh-looking though!). We’re at the good old Kings Norton junction here. I clearly want to lie down or go home. Or possibly both. Happy lady, happy lady, wahhh. Photo by Bernice, with permission. We got back to the park and went in squiggles to get Bernice’s 13.1 hooray! Great work and her longest run for a bit (although we’re doing the same marathon, she is on a plan with a personal trainer while I’ve done my own and am trying to get ahead of myself so I can get used to running long and not have a horrible shock when I get to the mara. Let’s hope this works!). Then Trudie and I ran round the park and back home, then she ran up and down the road to get to her 12 (her longest for ages, too, well done!!). I got to 15.1 and I was very, very pleased with that, and my pace, all things considered. A note on fuelling: I’d got some Tailwind samples in the week and tried the orange one. I didn’t mind the taste, though it not being sweet wasn’t a big bonus for me, and it WASN’T FIZZY, unlike all the tablet ones I’ve tried. It did go down well and I had no stomach woes whatsoever, I took in 600 mls of one sachet made up with 750 mls of water, with the rest drunk at the end and I didn’t take any gels – I felt OK but was quite hungry at the end. So I think I’d probably use it to replace every other gel and be my rehydration. I might well buy a packet of the orange though will try some of the other flavours, too (green tea is being given away, ugh, and I gave the lemon one to Bernice to try). I like the lower use of single-use plastic. I did buy some Gatorade powder too, though know that will only replace my single-use bottled lucozade, not the fuel. Sunday – Our water is off! Oh no! I’m typing this at 7.30pm and they’re still digging up the road. However I still went for a run, then contorted myself to have a wash in a washing up bowl and jug standing in our walk-in shower! I did a recovery run and went out with Mary Ellen, which was lovely. Ran past BOTH burst water mains, on my road and round the corner, and did a big loop. I did 0.2 miles more than this as forgot to start my watch. But I felt SO MUCH better once I’d worked into it – this is something I’m definitely going to keep doing. I take part in the Weekly Wrap run by two wonderful running women and joined by lots of other inspirational women. Wendy’s weekly wrap is here and Amy’s (covering for Holly) is here. A week of varied experiences, from tempo runs to run and talk on Time to Talk day, from the physio to a long marathon training run, from endurance officiating to track and field officiating. Phew. I’ve also been doing February Five, which was invented by my lovely friend Verity, who does huge amounts of fundraising for Mind: I have had to switch my “thing I do 5 days out of 7” from strength and conditioning work to two lots of rehab exercises a day … but it’s all good, right? Although Em doesn’t love running as much as I do, I did notice she was keen to get back to it once her physio said she could, so maybe we’ve got her. I bust a gut on this run and was chuffed to get a 10:50 final mile (super fast for me). I was trying out my new Saucony Hurricanes – I do like them and they’re definitely comfy round the toes, but they don’t feel as controlling as my Guides so I’ll have to hope they look after my overpronation. I did proper “Paul” running, knees up, pawing the ground behind me, and my cadence was 169 (up from my old 164) so happy about that. Wednesday – went to Dave Yoga and managed fine, thank goodness; felt good to be back in that class. Dentist straight afterwards was a bit of a shock to the system! Thursday – I had had enough of my right glute hurting and my right hamstring being sore – it’s been ages and it’s not right. My old physio, Fotios, has stopped working at the place I went to him, so I went back to my OLD old physio, Phil at Urban Body, who runs sessions out of the local council-run gym, 1.2 miles from my house. So I went down, full of having an SI joint issue or a hamstring impingement and being told not to run … to be told I have an overloaded hamstring with an old tear (when? I fear the Canal Canter) and scar tissue (now being worked on – owwww), a stiff lower back (more massage) and weak glutes (some v odd exercises). I knew about the glutes and I knew they would come and kick me in the arse (ha ha) and I also found out that when I stretch I’m using the lower back too little and heaving on the glutes, hence the overload. So I have some exercises, and rolling on the roller and a ball (I happen to already have) and I can still run (PHEW). I went almost straight from this session to running a Run and Talk session at the running club as part of the “jeffing” (walk/run strategy). I run jeffing with the lovely Ruth and Maria is my co-Mental Health Champion, so the three of us put on this session together and we were very pleased to have club chair Barbara along, plus 9 other runners (the most we’ve had for jeffing yet). We suggested a chat about how you relax, and I’d also posted the question “What does running do for you?” in the Club Facebook group, and we’d had lovely responses to that. It was a great run and we had some lovely comments afterwards; I did two laps as my leg was aching after Phil’s ministrations, then gave out badges, leaflets and postcards to the runners who were finishing after two laps, and waited for the other runners to finish. I also gave out postcards and leaflets to other runners who were finishing their own Thursday sessions: I’d got some lovely resources from England Athletics (who run the Mental Health Champions and Run and Talk initiatives with MIND, and from Time to Change, whose Time to Talk Day it was). A great and joyful evening, I was so pleased at how well it went. My husband took a poster and leaflets into work, which was brilliant, too, and I also shared them with our friends at Bournville Harriers. and it was pretty windy. Barbara and I were the two officials, doing A Board Judge Recorders, which means standing at the end of the funnel after the finish line and calling (me) and writing down (Barbara) the bib numbers as the runners come through. A line judge has put them in the right order, funnel managers keep them in the right order and moving down the funnel, and B Board are part way down the funnel, also writing down. Then there are tokens with finish positions at the end. We had a good time doing it and all went well, wet and windy weather notwithstanding. We also rescued a fellow team’s tent that blew over while the racing was going on! Sunday – Long run time, and having done 13.5 last week, I was keen to build up to 15, getting my marathon / ultra training a bit ahead just in case and to allow me to progress an extra mile at a time. But. But. BUT in previous campaigns I have had real trouble getting to 15, and have bailed a few times when trying. Which I told Trudie and Mary Ellen at the start. Nothing like a bit of positive thinking, eh!! So we set off on a version of my 10-mile route to Northfield and round, but with a diversion at the university which added some miles. Trudie, Mary Ellen, Liz: we didn’t do any of these things. Thanks for the photo, Trudie. We carried on (getting overtaken by svelte, fast, tiny-shorted, young runners just when we were powerwalking up a hill) to where I met up with the coach from another club who I will be helping with a bit of officiating on their behalf in their track and field leagues. He’d wanted to meet me which is completely fair enough as you need to check officials know what they’re doing, their level of qualification and their fitness for the job. I passed muster, joined the others and carried on. I was getting a bit tired but cracked on, with my Lucozade sport and three gels in total. I was a bit whiny but the others got me round. And it was nice to visit The Vale, one of the main sets of halls of residence for the campus – a nice women took pity on us and took our photo so no propped-on-a-bench one this time! Taken on Trudie’s camera and kindly sent to me – notice my knock knees. Must try harder! I take part in the Weekly Wrap run by two wonderful running women and joined by lots of other inspirational women. Wendy’s weekly wrap is here and Michelle’s (standing in for Holly) is here.